While three years of fragmentation have brought little healing between North and South, there are growing signs that reconciliation is possible, evidenced in a surprisingly positive response–from certain states in the South–to U. S. Abraham Lincoln‘s four month-old offer of amnesty and reconstruction. Yet even within the glimmers of reconciliation remains a stark reality: the states with the highest percentage of black slaves remain doggedly resistant to overtures from the United States, determined instead to defend the institution of black slavery to the very end. Aiding the most vocal defenders of slavery are “peace democrats” (also known as “Copperheads”) of the North, who oppose the war and demand an immediate peace treaty with the Confederacy. Thus, even as Lincoln works to reconstruct rebellious states, he is forced, in this presidential election year, to keep a wary eye on Northern politicians and their followers who are determined to effect a different kind of reconciliation altogether–a reconciliation that will do nothing to end the chasm between the free and the enslaved. 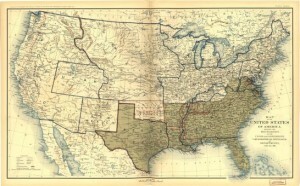 Among Baptists, those of the North are mostly determined to bring an end to slavery, while those of the South are increasingly splintering along socio-economic lines: white elites (many of whom are slaveholders, while the wealth of others is indirectly the result of black slavery) defend the peculiar institution, while more and more common folk white Baptists, albeit yet racists, are increasingly angry at this “rich man’s war, poor man’s fight.” Their resistance manifests itself in army desertions, oaths of loyalty to the United States, and growing apathy on a home front characterized by poverty, hunger and despair. The Confederacy, in short, seems less and less likely to be able to ensure the survival of white common folk. Among black Baptists of the South, many have already escaped slavery and are now fighting in the Union Army or temporarily housed in Union freedmen settlements. The ranks of the escaped grow daily, while those yet enslaved anxiously anticipate reconciliation in the form of their own freedom. Reconciliation is also a theme within Baptist congregations. Discipline has long been a part of white Southern Baptist church life, applied to a long list of moral offensives that include adultery, fornication, drunkenness, card playing, dancing, playing the fiddle, and participating in various other worldly amusements. And yet for all the emphasis on discipline, Baptist congregations usually stand ready to receive sinners back into fellowship upon repentance on the part of the sinner. April, 1864 – A letter was handed in from J.S. Upchruch who is now in the army stating that he felt it his duty to belong to some church of Christ and desired to be restored back to full fellowship in this church and that he had forgiven all past offences and hoping that he would receive the same from the church and he felt that he needed there protecting again and on motion he was restored to full fellowship in the church. P.W. Dowd, moderator. C.R. Scott, clerk. This example of willing forgiveness which is so often evidenced in local Baptist congregations could, one might imagine, provide a model for reconciliation between North and South, should the Confederacy lose the war and freedom be extended to all blacks.